GrammarAndMore.com One of 2013's "Top 101 Best Back-to-School Websites"
• Hands-On English: the English handbook that makes grammar visual -- so that students can understand grammar and remember it. Easy-to-find, easy-to-understand information about usage, capitalization, punctuation, writing, studying, and more helps students complete their schoolwork efficiently and effectively, minimizing their frustration and building their independence and confidence. • Tips for Success in School: two dozen things parents can do to promote their children's school success. Example: Recognize that there will be times when your child will be frustrated by a difficult task. Resist the temptation to solve the problem yourself. Your child will learn and grow from this experience and will emerge with confidence to face the next challenge. • Improve Kids' Reading: ways to help even reluctant readers develop comprehension strategies -- possibly without a book in their hands. Example: Help your child recognize that things are not equally important. Even through conversations not related to reading, help him identify relationships -- similarities, opposites, sequence, cause, examples, etc. • Tips for Teaching Writing: breaking a complex process into manageable parts. For teachers, parents, and adult writers themselves. Example: Make writing enjoyable for both you and your children. Children are more likely to enjoy writing when they understand the value of communication and can share ideas they care about. They are more likely to enjoy writing when frustration is minimized. To make the upcoming school year more successful for the students in your life -- and more enjoyable for you as well as for them -- treat yourself to Hands-On English, and explore the other resources at GrammarAndMore.com. GrammarAndMore offers a variety of resources to help you enjoy English and use it effectively. Portico Books, our sponsor, offers products that take the mystery out of grammar by using icons to represent parts of speech. For example, a cube represents a noun, and a spring represents an action verb. A paintbrush depicts an adjective because it can change the appearance of a cube the way an adjective modifies a noun. Icons can be combined to show the components of different kinds of sentences. The icons are an integral part of all of Portico Books' products -- from Hands-On English, a concise handbook, to Hands-On Sentences, a card game that helps develop familiarity with parts of speech and skill in sentence construction. 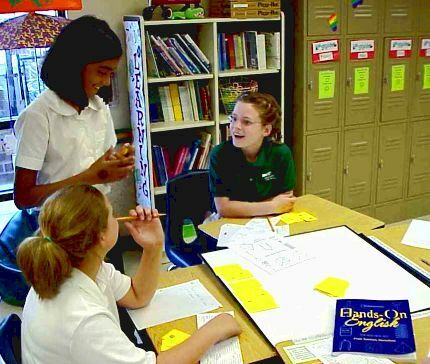 In addition to grammar, the Hands-On English products and other resources on our GrammarAndMore site will help you develop skill in usage, punctuation, capitalization, spelling, vocabulary, reading, and writing. These skills will help you communicate more effectively. 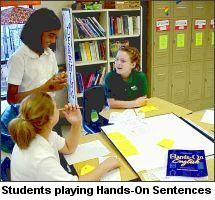 Our products, Hands-On English, The Activity Book, Hands-On Sentences, and Hands-On Icons were developed by Fran Hamilton, using her years of "hands-on" classroom experience teaching students about grammar and the effective use of language. The Grannie Annie Family Story Celebration invites students in U.S. grades 4 through 8, and homeschooled and international students 9 through 14 years of age, to interview their family storykeepers and write a 275- to 500-word story about something they learn from their family's history. The Grannie Annie encourages students to share their stories with their extended family and their community -- and to submit the stories to The Grannie Annie for possible publication in an annual collection. Learn more about The Grannie Annie.